The world's human death toll from bird flu has reached 103 since late 2003, the World Health Organization has said. The latest deaths from the H5N1 strain occurred in Azerbaijan, where five have died since February, the WHO reported. The virus cannot pass easily from one person to another but there are fears it could mutate, triggering a pandemic. US scientists have confirmed the H5N1 virus has evolved into two genetically distinct strains, potentially increasing the risk to humans. The team from the US Centers for Disease Control and Prevention (CDC) also said this could complicate the search for an effective vaccine. UK young women risking Liver disease by "out-drinking men"
Young women are out-drinking men of the same age in the UK but in no other European country, experts are warning. Analysis of a Europe-wide study also shows that alcohol consumption in southern Mediterranean countries is falling, but rising in northern Europe. Liver disease is now seen in younger people, Professor Moira Plant of the University of Western England said. She will tell a nursing conference on Thursday that alcohol is cheaper and more available than ever before. 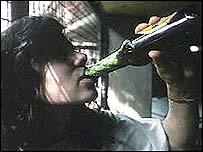 Professor Plant, a specialist in alcohol studies, warned that if young women in Britain continued to drink in this way, that they could present problems for the health service in the future.